Graphics are good. Graphics are shiny. But when it comes to reality-bending, emotionally-immersive, perception-shifting power, look to sound and music. At least that’s the feeling you could get after playing Dimensions. Following their reactive music tools and Inception dream states for iOS, RjDj have turned their mind-altering sonics to gameplay. As with previous releases, these tools are powered by the open source visual development environment Pure Data. Pd engineering wizardry here meetings the compositional and sound design prowess of Hans Zimmer. You can see a bit of how the musical world works in the teaser video above, and the music sound design video below. But we wanted quite a lot more information. So, CDM got RjDJ’s Rob, Joe, and Martin to share some detailed thoughts on how the game experience is put together and how it works. RjDj Team: Most games require your full attention when you play them. You either live your life or play the game. Dimensions is different. It’s designed to be played in parallel with your normal life. Gameplay is intertwined deeply into your daily life. Some dimensions unlock if you are physically active and others unlock if you are quiet. The app automatically detects what you are doing and syncs the game to it making use of every possible sensor on the iPhone. You stay immersed in the game by listening to augmented sound and the voice of Emily from Mission Control. She guides you through many exciting challenges like collecting Artifacts and avoiding the dreaded Nephilim. With Dimensions we are very interested in creating a gameplay experience which is between the device based focus of a casual game and the passive use of listening to music. Its a game which you play by listening – a game that place in parallel to your everyday life. We built our own version of readsf, rj_readsf, in order to be able to read compressed audio and make the samples available for processing in Pd. One advantage of readsf is that possibly lengthy audio assets do not need to be loaded into memory. If memory is limited, especially when Pd may be running in the background, limiting exposure to system memory warnings helps keep the app running and the music playing. Given that compressed audio is roughly ten times smaller in size than uncompressed audio, and that audio assets make up the majority of the size of the entire app, it is a huge benefit to be able to deliver and read compressed audio assets directly, without the need to decompress in memory or onto disk. Dimensions requires that several dozen such players be open and viable at any time, and special consideration was given to concurrent behaviour. rj_readsf can loop a file when it gets to the end, and it indicates with a bang when a file has been loaded (an asynchronous operation) or the end as been reached (in the non-looping case). rj_readsf is built on iOS standard APIs and can read any file format that iOS can. This is perhaps the most recognisable technique we use. We process audio from the iPhone microphone live in many different ways. It’s kinda like a feeling of being inside the music. The key thing we do with effects is attempting to analyse the environment of the player / listener and then making appropriate things happen within the effect. For instance, the Flux Dimension features a filterbank on the mic input. We analyse the incoming audio from the players environment and make the filter frequencies change as events occur ( either due to pitch changes or onsets ) this gives the impression that objects and activity around the player is somehow “playing” the music. In the Ghost Dimension there is an effect which records audio whenever it detects an event, then scrubs repeatedly forwards and backwards through the sample using granular techniques stretching it out in time. This manipulation accentuates the textural and pitch based qualities of the sample as it repeats and works well with the atmospheric music Hans Zimmer composed. All the Dimensions use stems and hits from a conventional sequencer in some way, re-arranged live on the device relative to how the player is interacting. These stems were mainly composed in Cubase and Logic. For example, in the Kinetic Dimension we feed accelerometer data from the device into Pd and drive the music from that. The player hears more energetic beats when they go for a run, but if they stop at the lights to cross the road, the drums immediately drop away. This was achieved with a large number of hits with all the rhythmic sequencing happening in a hybrid reactive / generative way live on the device. In the Tranquil Dimension, the music introduces more stems the longer the player is quiet. If they make too much noise the music “shrinks away” from them and becomes quieter. If they stay in a Zen like peaceful state, the music grows into a kind of crescendo of serenity. We often control parts of the music by doing a frequency analysis of incoming microphone audio from the device and then using those frequencies to determine the notes synths will play within the music. The Travelling Dream in Inception the App uses this extensively. Tranquil Dimension in Dimensions also uses onset and frequency changes to trigger synth melodies in the music. 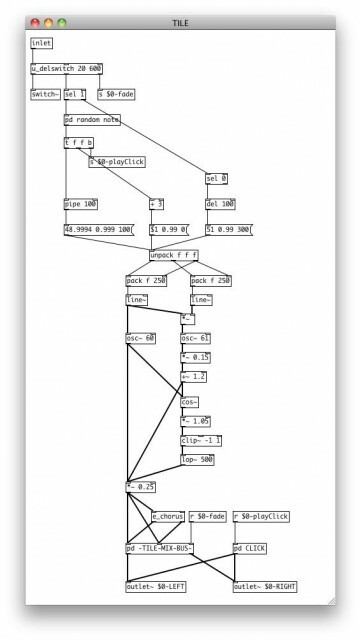 The synths we use range in complexity from very simple additive synthesis to some great synth patches from the rjlib by Frank Barknecht and Andy Farnell. There are some sections within Dimensions which are generative. These play back prepared samples as well as triggering onboard synthesis. They also feed the results of this through various live sampling and glitching patches. They are governed by various sets of rules which have various long term parameters, like adjusting to the intensity of the audio environment of the listener, or how dense areas of music have been around the present time. Ghost Dimension uses a simple but effective technique of triggering samples from the music on onsets in the environment. This can cause some real jump out of your skin moments. We combined this section with a randomised very short delay on the mic which acts almost like a resonator, turning the mic sounds into creepy atonal pitched noises. The main hub section in Dimensions, called the Launch screen, acts as a entry point to your augmented adventures. It also displays all available Dimensions via the floating tile icons. Visually, these represent a snapshot of your previous experience using your location at that time. Sonically we wanted them to have an aura or energy from the Dimensions themselves. 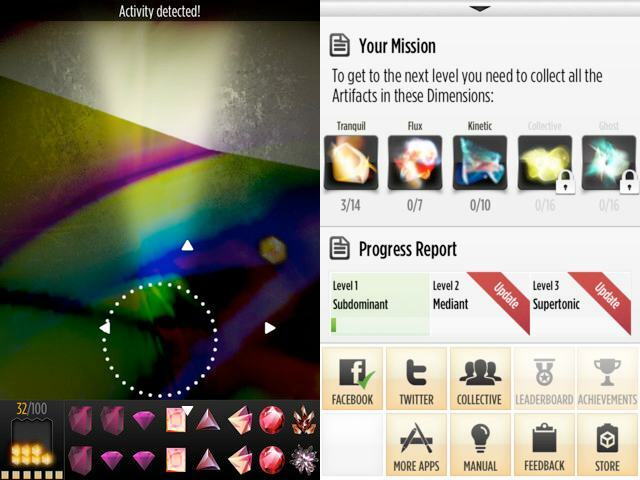 Example of using mixture of synthesis and samples to create user feedback when interacting with Dimension icons in the game. Map Tile Down: several recordings of a synth in Pure Data that is played when the tiles are touched. Each one is slightly different due using two detuned oscillators. Map Tile Open Only: a sample from Logic Pro for the woosh sound when showing the information view. 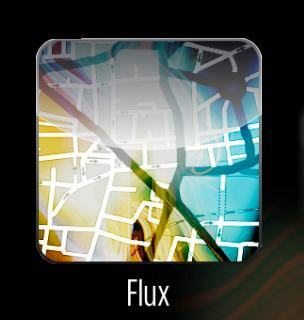 Map Tile Click: a sample from Logic Pro for touch events. Map Tile Open: recording of how it sounds when put together. Sound is a mixture of samples and real-time synthesis. The energy sound is made using two oscillators (one detuned) to create some modulation for a glowing effect. Added to some harmonics to make it more of a beam sound and some chorus and reverb. The open tile is made in logic, when closed it’s the same sound but reversed and pitched down in Pd. We wanted the tiles you tap on to feel like each Dimension has some sort of energy radiating out. It’s an ambitious app, and the whole cost is US$2.99. I guarantee it’ll change your world more than a latte. (Well … unless we’re talking a really crazy latte. And that might not be legal.) As sometimes-CDM contributor Jaymis Loveday notes, there are terrific choices in coloring Google Maps, and how modes change based on ambient sound and motion. Requires an iPhone 3GS or better, or third-generation iPod Touch or better, or an iPad.